As summer approaches, pool owners everywhere begin thinking about when to open their pools for the season. They think about all the poolside parties, a good lap-swimming workout, and weekends spent lounging by the water, soaking up the sun. Often, there’s one aspect of pool ownership that gets pushed aside: Maintenance. Many times, maintenance is an afterthought, neglected until the walls turn green from slime or a filter gets clogged with leaves. However, waiting until problems arise can end up costing a lot more time and money than if you simply establish a good maintenance routine. Perhaps you’re a brand new pool owner, or maybe you’ve owned a pool for years. Either way, it’s good to have a clear idea of how you’re going to keep the pool clean and well-maintained all summer long. The only way to do that is to ensure you have the bases covered with these tips and tricks. If you’re a beginner, shocking doesn’t mean surprising your pool. Shocking means raising the chlorine levels for a little while to kill bacteria. It should be done at least twice a season or whenever the water looks murky, such as right after a big pool party. But you need to do it right to avoid over- or under-chlorinating and to prevent damage to yourself, your pool liner, and filter. The best way to do shock is to dilute your concentrated chlorine by mixing it into a bucket of warm water. Mix it well to dissolve evenly while wearing protective gloves and goggles. Then pour it into your pool. Be sure to only shock the pool at night, however. The sun burns off chlorine at about 1 ppm per hour, which reduces the effectiveness and wastes money. Shock at night for the best results. Just be sure no one will be doing any night swimming. This should become like brushing your teeth, something you automatically do on a daily basis to keep things clean. Every day, you should be skimming leaves and debris from the water’s surface with a net skimmer. If you have a little extra cash, robotic pool vacuums can be a big help in keeping the pool floor and sometimes the walls clean. 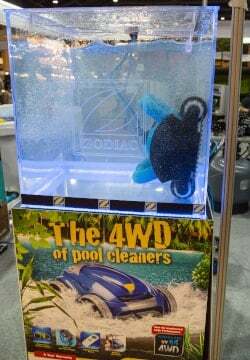 We have some great options for the top robotic pool cleaners of 2019 here on our site. There are also suction-side and pressure-side cleaners that provide automated cleaning for a little less money. Automated cleaners, even those with smart tech, are only so smart. They won’t catch everything or be able to reach every corner and surface. You’ll need to manually brush the walls and pool stairs at least weekly, to dislodge stuck-on algae and debris that your automatic cleaner will miss. Ideally, your pump should be running 24 hours a day all summer long for the best filtration results. Not everyone’s budget and equipment can sustain that, however, but aim to run your pump at least 8 hours a day each day. Think of your pool pump having a full-time 9-5 job. 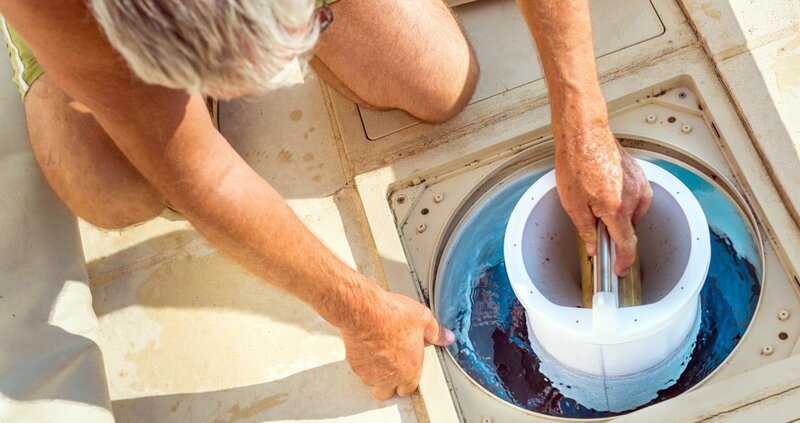 That consistent circulation is the number one way to keep the water clean and healthy. At least once a week, you should clean out the filter basket to remove all the debris it’s collected. Neglect that, and your pump will work way too hard to move the water through the clogged filter, thereby shortening its lifespan. At least once a month, depending on how much debris your pool collects, you should backwash your filter. This means reversing the water flow and redirecting the water out of a waste port that flows out of your pool. The type of filter you have determines how you’ll backwash, but the end result is removing all the built-up dirt that can clog the pipes and other areas that you can’t clean simply by emptying the filter basket. pH levels: How basic or acidic your water is on a 0 – 14 pH scale. Low pH means acidic (0 – 7), while high pH is basic. You should aim to keep your pool water within the neutral zone of 7.4 to 7.6. Alkalinity: a pH buffer that prevents spikes in acidity or basicity. Your ideal range should be 100 – 150 ppm. Sanitizer: Whether chlorine, bromine, or something else, this is necessary to kill bacteria and other microorganisms. Levels vary depending on what you’re using. 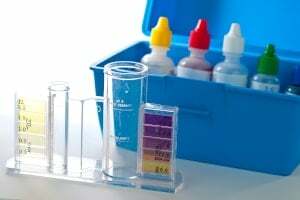 At least once a week, test your water with a good testing kit. Go slowly, follow all directions to the letter, and carefully adjust chemicals according to results. 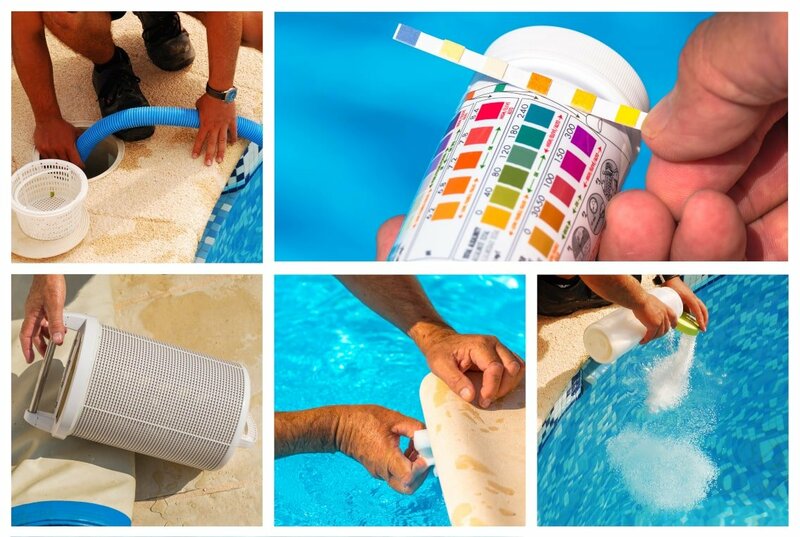 Once a month, collect a sample and bring it to your pool supply store. There, they should have high tech testing equipment that will give you an even more accurate picture of the chemical composition in your pool. If you have any leaks, cracks or anything that you’re not able to easily fix as part of your maintenance routine, call a pool service professional to come take a look. Don’t wait, or the problem could get so out of hand that it’ll end up costing you a ton of money for a major repair. Even though you may not see any problems or think it’s a waste of money, have a service professional come out once a year just to check everything and make sure it’s in working order. 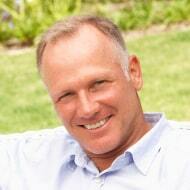 They may be able to catch things you’ve missed or offer tips for better maintenance or pool products. The best time to do this is right after opening the pool for the summer. Tennis balls to catch oils – Think about all the sunscreen, suntan oil, conditioner, and natural oils from skin that can come off as we swim. These oils leave a greasy sheen on the water and build up all around the waterline, not to mention clogging up your filters. The natural fibers on tennis balls, however, can absorb the oils, so toss one or two into the skimmer basket or right into the pool itself. Replace the balls when they start to show wear and tear. Keep your pool deck clean – It’s easy to spend all our time thinking about the pool water while neglecting the deck around it. But if you don’t clean the deck, you’ll track dirt, algae spores, and bacteria right into the pool. Sweep up loose leaves and debris a couple times a week. To sanitize, give it a good scrubbing at least once a month with a long-handled brush and a solution of water and pool deck cleaner. Or use a pressure washer with detergent. Keep street clothes out – Only proper swimsuits should be worn in the pool. Street clothes can carry chemicals, fibers and other contaminants into the water. Likewise, the pool chemicals can damage your street clothes. So keep them out! Swimsuits should be washed by hand in mild detergent and hung or laid flat to dry after EVERY time they’re worn. If you can establish a good routine that includes these tips, you’ll be enjoying your pool for years to come. For more pool cleaning tips, read our article on 12 tricks you may not have thought of.